Home Costs > How Much Does Board and Batten Siding Cost? Board and batten is a type of wood siding which alternates wide boards and narrow-like strips lined up side by side, with all of the seams covered by a strip known as Batten. Often referred to as barn siding or vertical board siding, this type of siding was commonly associated with barns and cottages, but today, it can be found on modern homes as it offers a timeless yet attractive look. From our research, the costs for board and batten exterior siding, including professional installation, will be about $4 to $7 per square foot. The materials, depending on the type of wood being used, and the store it’s purchased from, can cost $2 to $4 per square foot alone, while labor rates can be another $1.50 to $3 per square foot. If you were to hire a professional contractor, the costs will really depend on your geographical location, the type of board and batten siding and the complexity of the project. Since these projects can be so unique, we highly recommend you use HomeAdvisor.com to find contractors in your area who are able to offer you a free, no-obligation quote. Simply describe your job and contractors will contact you with an estimate. As you can use different types of wood, the costs can vary by more than a few dollars per square foot. Plywood, pine and fir, for example, are often the most inexpensive options and are often painted over. A higher-grade, such as a vinyl board and batten or engineered wood, will already come in the color you want and will cost more due to the manufacturing process. Depending on your situation, there are additional costs, aside from the estimates mentioned above, you may want to think about. This can include the battens, nails, mounting blocks, soffits and fascia. Even if you were to hire a professional, they may or may not include this in the initial estimate and could charge a separate cost. These costs, to budget properly, can safely add another $1.50 a square foot to the estimates above. While it isn’t an extra cost to think about now, you will want to think about the maintenance involved in the future such as staining/painting, sealing and replacing damaged boards. Board and batten siding, considered to be a top “rustic” choice, is a type of vertical siding which will use a flat board, similar to that of a clapboard siding. These boards usually range anywhere from eight to 12 inches wide and can be as long as 12 feet in length. The battens, typically one to four inches in width, will usually be the same height as the main boards and are installed between the boards, creating a classic or rural-like look. As with many siding choices, homeowners are able to customize a look that can complement their home’s overall theme. Wood – Out of all the material choices, wood tends to be the most popular choice, with cedar, pine, plywood, fir, white oak and redwood being the most popular choices for homeowners. Besides the natural look, many homeowners choose natural wood for its price point, maintenance and durability. Vinyl – Like vinyl siding, these boards are molded to create a wood-like appearance. Even up close, you can still see the wood grains and most won’t even be able to tell from a distance. The CertainTeed Corporation, for example, offers a variety of color and sizing options. Engineered Wood – Engineered wood boards are often made from wood chips and a commercial adhesive created when using intense heat. This type of material is light in weight, extremely durable as it can last more than 25 years. Eye-catching design and choices. Most houses often choose the same-old siding choices, which, unfortunately, doesn’t turn a lot of heads. Board and batten siding, once installed, can turn heads as it provides a very unique and eye-catching design that’s sure to receive some compliments. It’s durable. The reason this siding has been used for hundreds of years is due to its long-lasting durable construction. 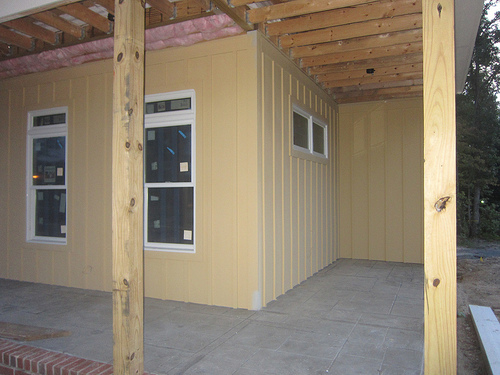 When constructed, the method implemented allows the siding to naturally expand and contract in any weather elements, allowing it to prolong its life when compared to other siding materials. Even in the harshest weather conditions, it can look like new, even years later. Great for resale value. Pleasing to the eye, real estate agents note that this type of siding can not only increase your home’s style, it can increase the value as well. Versatile. Being real wood, a contractor is able to cut it in any size you can envision. It can also be installed vertically or horizontally, depending on your preferences. Maintenance demands. As with a lot of materials, board and batten siding will require a lot of upkeep due to it being wood. This means you will have to frequently powerwash it, seal it and stain/paint it as time goes on. In general, experts recommend re-staining or painting every 10 years to keep it looking like new. Termites. Being wood, even though it may look “fancier,” it doesn’t mean termites won’t gnaw away at it. This may not be the case, however, if you were to use an engineered wood. Rot. If you do decide on real wood, it can lead to wood rot, which is often a problem for any siding or wood material for that matter. However, if treated and sealed when necessary, this problem can be avoided. Damage. Vinyl siding, if you go ahead with this choice, can often crack due to the excessive exposure to the sun, which, for the environmental-friendly folks, can mean the damaged pieces will land in a landfill, eventually affecting the environment.